- 600g Jasmine rice, cooked. 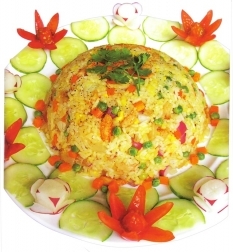 - 200g radished (1/2 diced, 1/2 cut into flower-shapes). - 5 tablespoons vegetable oil. - 3 teaspoons with flavouring from meat or prawn (Knorr or Scrook). - 4 cloves garlic, minced. - 2 teaspoons minced shallots. - 1 teaspoons ground pepper. - 2 cucumbers, thinly sliced. - 2 tablespoons soy sauce. - 5 cherry tomatoes (for garnishing). - 1 chilli, thinly sliced. 1. Marinate crab meat with stock flavouring together with the chopper shallots & pepper. 2. Blanch the carrots and peas until cooked, leave aside for adding to mixture later. 3. Heat 4 tablespoons of vegetable oil in a wok adding shallot, garlic with beaten 2 eggs to the mixture and rice together. 4. Mix all ingredients well and add crab meat, green peas, onion, raddish, carrots all together into the wok and keeping stiring adding stock flavouring, salt and pepper. Mix all ingredients together for about 10 minutes. 5. Put some rice in a serving bowl press down hard, turn the bowl upside down onto a serving plate. 6. Garnish with cucumber, cherry tomatoes and radishes. Serving tips : Serve with a bowl of soy sauce and a sliced chilli.